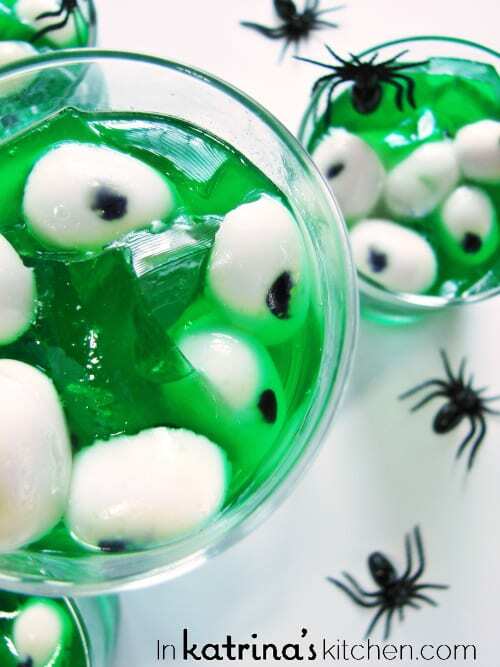 These Creepy Peeper Halloween Jell-o cups are just creepy enough to be cool…even for little kiddos! So, you know I have boys, right? I’m outnumbered 3 to 1, in fact. That means no princess costumes, no glittery face paint, no plastic jewelry, no fairy wings, no tutus, nothing. It has been happening slowly over the past 5 years, but I have started to think like a boy. I get excited when I see farm equipment. I slow down the car a little as I pass excavators digging. I even know what an excavator is and how it is different than a bulldozer. It’s a sad thing. 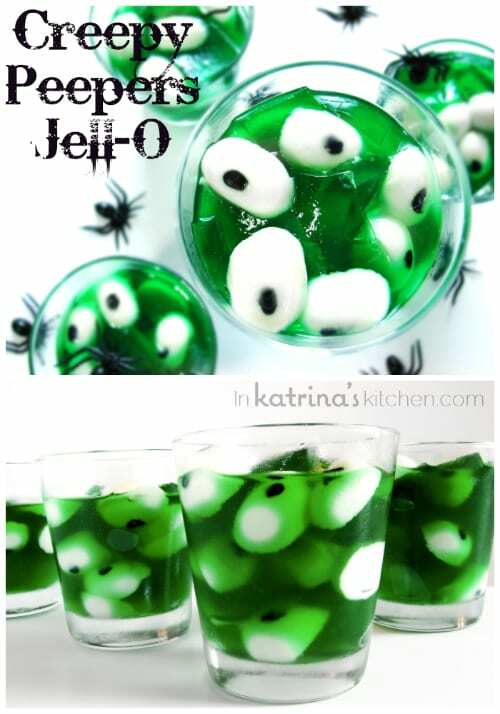 So I made you creepy Halloween Jell-O. 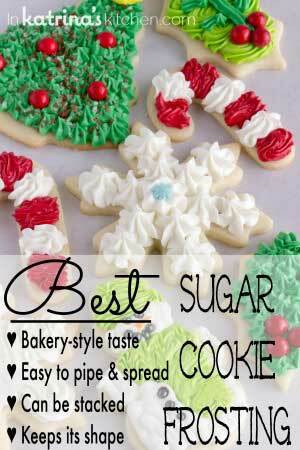 You could also make this in a 9×13 dish instead of cups. I would still recommend reserving 1 cup of the Jell-O to pour over the eyes after you add them to the dish that way it won’t look like all of your eyes have sunk to the bottom. Or floated to the top. Or whatever. Bring 2½ cups water to a boil, pour over green Jell-O and stir 3 minutes until dissolved. 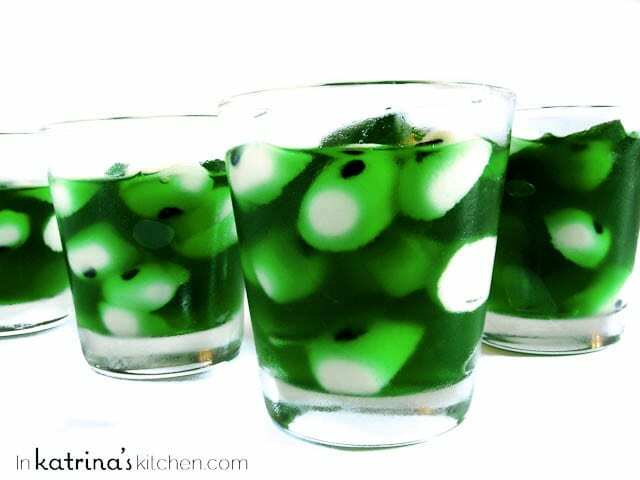 Reserve 1 cup of this green Jell-O, set aside. DO NOT REFRIGERATE. Pour remaining Jell-O into a greased 9x13 dish and refrigerate. Bring 1 cup of water to a boil on your stovetop. Stir in sweetened condensed milk; stir to incorporate. In a small bowl with 1 cup of cold water sprinkle in 2 packages of Knox unflavored gelatin. Let stand (about 1 minute) to “bloom.” Add ½ cup boiling water. Pour the unflavored gelatin mixture into the milk mixture. Stir to combine. At this point you have a pan of green Jell-O and a pan of white Jell-O in the refrigerator and a cup of Jell-O on the countertop. You will need to go find something to do for at least an hour, probably closer to 2 hours. When firm to the touch cut green Jell-O into small pieces. Pop out white eyeballs or use a small circle cutter (cake decorating tip, bottle cap of vanilla, etc.) to cut out white eyes. Add black pupils with a food coloring pen. 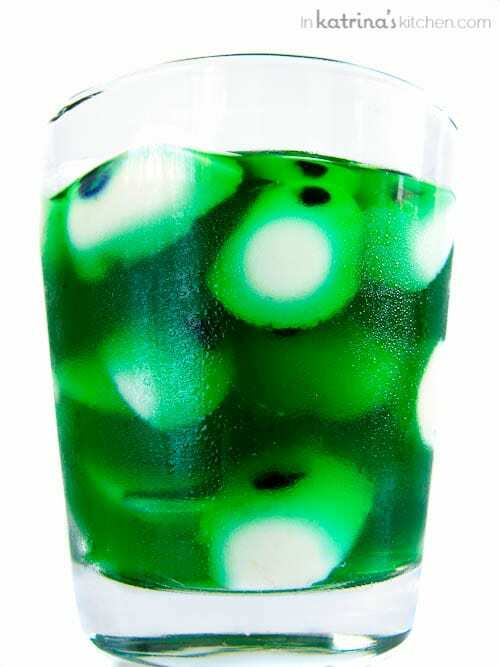 Layer green Jell-O and eyeballs into small glasses. Remember that cup of Jell-O on the countertop? Reheat in the microwave for 30 seconds if necessary and pour over the cups. Return to the refrigerator for 1 hour. SO FUN! My oldest would get so excited over this! I really want jell-o now. Wow, those are insane – I'm almost 30 and I'm a little creeped out just thinking about eating these 🙂 "Please send pink" – that made me laugh out loud for real! These are so creepy!! Creepy in an awesome way! I love this! And I think girls might too 🙂 It's my fear to have all boys when we have kids! Fun! Fun! They do look creepy! Heh! That is the COOLEST! I bet everyone LOVED it! 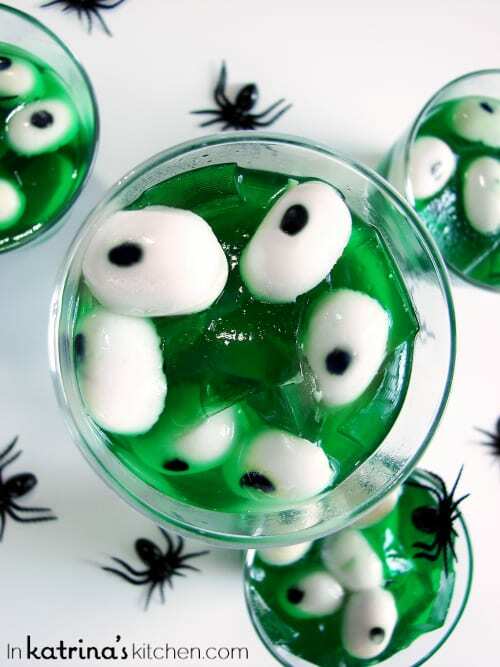 Such a clever Halloween jello dessert! 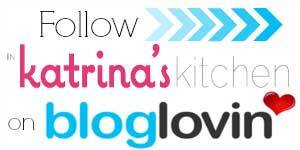 My recent post WonTon Soup! Lots of fun with these!!! I ,also, have raised boys and am used to everything that's boy-ish and gross! These are definite crowd-pleasers! Popped in from SITS! Those rock! This stuff is hilarious! But yes, my girls, particularly the older one, would prefer this in pink. My son would love it as is! Omg this is so cute! I love all of the different Halloween ideas! Creepy and creative, you rocked this one! As the mother of 3 grown boys, I'm with you on the boy thing.No pink anywhere, Don't worry! Your latent feminine traits will re-appear if you have a daughter or a granddaughter! These are so cool. Happy Halloween! My pink loving daughter thinks this eyeball jello is awesome. So perfect. Now I gotta post on these at Edible Crafts, too!! The eye/bean mold is so awesome! I'll be hitting you up for ideas when lil man is older – you know I'll need help! BRILLIANT! I want little boys now! I want to make eye balls and creepy candy corn monsters and all manner of Halloweenie boy fun stuff! Love love love these! How cute are those!? I love the idea…too cute for Halloween! Awesome Katrina, bring on the Halloween! I bet the boys went crazy for them. I had to get two boys dogs to balance out the estrogen in the house, maybe you need a couple girl dogs, just a thought. Hope you have a great week. Wow! That jello does look seriously creepy. And it's so funny that you've started to think like your boys do. Love these! So creative and festive! AHHHH OMG OMG I LOVE!!!!! These are great! My nephew is coming into town this weekend (he is 3 years old) and I will def be the coolest Aunt on the planet after making these! hahahaha they really are creepy! but they sound great for parties! oh my these are brilliant!!! The 'please send pink' did me in! Lol! I have always thought more like a boy. I was raised by wolves 😉 These jell-o peepers did give me the heebie jeebies though! You are just so creative!! These are such a boy treat, my son would love them! This is such a fun idea! 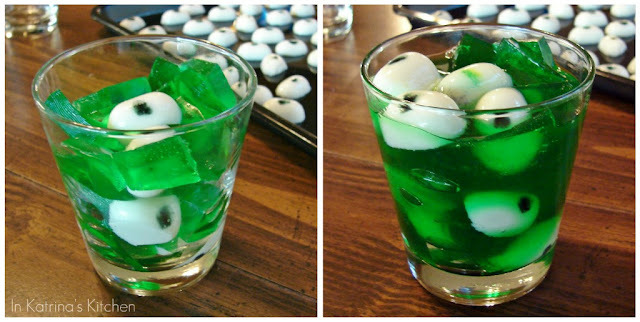 Who needs pink when you have jello eyeballs in a glass?!? love this – my girls totally did too! Glad to get some more miles out of the jelly bean jello mold. now only if I had a brain one! thanks for the fun and creepy recipe!! Oh my heck! This is so awesome! My kids (both of them) would LOVE this!!! Now those are sure to creep out even the bravest little boy! You are a creepy Halloween genius. Can I just tell you how awesome you are!? I've got 4 boys myself and, despite my best effort, they are rubbing off on me too! They will just LOVE these…and so would I! You are truly the coolest mom ever!!! I know what you mean about boy stuff… I have one of my own and a girl who used to be quite a tom-boy. She wore buzz lightyear underwear for the first 4 years of her life! (Please don't tell her I wrote that!!). But we still love stuff like this too. Both of my kids would love this! As a matter of fact, I think I have a group of dance girls who would be pretty happy with it too!! As a fellow girl living amongst boys, I LOVE THIS! I think like them, too….can totally relate to that. 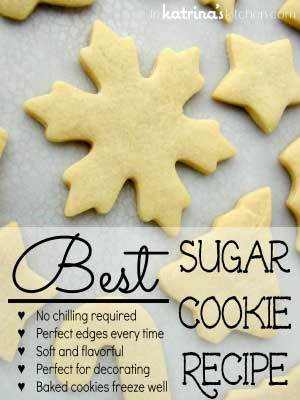 My boys would love this cute recipe!! Woah! That's totally awesomely gross! My boys will love it! thanks! Despite the floating monster eyeballs, I find these really awesome and I'm sure, super tasty as well. This is the coolest, easierst Halloween recipe! Genius! Woman, these are freakin' amazing!! I love your creative mind!! oh my goodness, so spooky and so much fun! LOVE them! I have girls…two to be exact….so it's all pink over here. But those creepy jello cups are fabulous…as in if I were boy disgusting, icky, yucky type of fabulous! These are so cool! Have you seen the jello brain mold? We ordered one… I know how weird is that? But seriously I can completely understand where you are coming from as I am a mom to 3 teen boys and they still like this kinda stuff. I even get requests for finger food (shortbread cookies shaped like fingers complete with painted nails and age spots) when they are supposed to take something in. Pink? What is that? A type of scissors? Like pinking shears? Ha Ha! 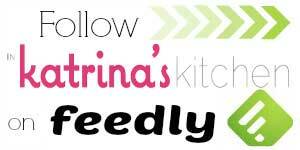 Great recipe and thank you for sharing it! I LOVE these! I am soooooo making these for our Halloween party next week!! 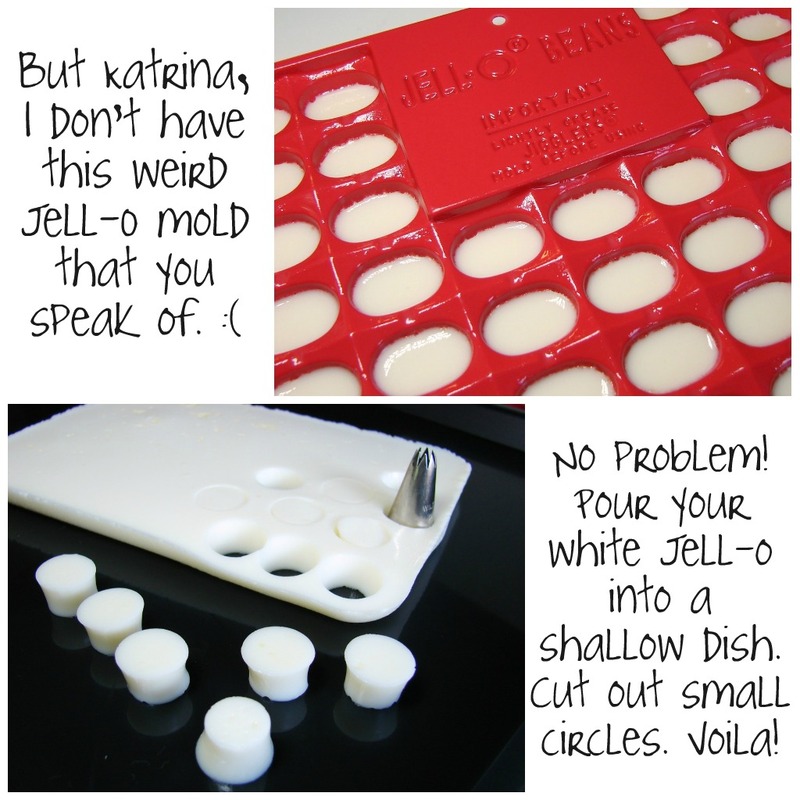 And I am a Jello-fanatic…and I do have the Jello-beans molds, I have ALL the jiggler molds…should we start a support group?? What an entertaining writer you are — fun idea ! That is so creepy cool! I know what you mean about the boy thing. I almost yelled out Train! when I was driving by myself. Oh how my life has changed (although I'm lucky to have a pink one as well)! Made these last weekend – ended up adding 4 packets of knox gelatin (instead of the 2 in the recipe) – substituted cream of coconut for the water in the eyeball part. Delicious! We all LOVED it!! Awwww that's cute. Nice touch on the green jello. I will definitely use this for next year's Halloween. Thanks for sharing. Such an awesome dessert! 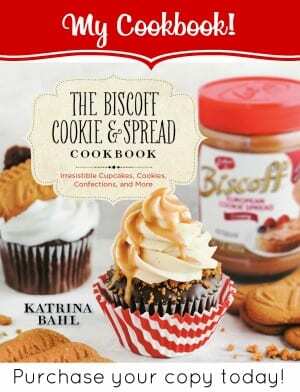 I included it in my Halloween Recipes post…love it! Finally! A use for my Jello jelly bean mold! See, you're not the only one! 🙂 Tnx- fun recipe! Great question but I’m not sure how to make the white eyes without the sweetened condensed milk. making these for work… I have the mold and never used it. My clients will love it! Thanks! Being a mum of two boys (and loads of little boys in the neighbourhood) these are going to be a great hit for Halloween tomorrow. How many kids cups does this recipe make please?